On December 9th, the Catholic Church celebrates the feast day of St. Juan Diego, who was the first indigenous saint of the Western Hemisphere. St. Juan Diego was a lay person who lived a simple life in what is now Mexico City. On December 9, 1531, as he was walking to Mass one morning he passed Tepeyac Hill and heard music and a woman's voice. What followed was the apparition of Our Lady of Guadalupe, which is celebrated on December 12th. This apparition 5 centuries ago has changed the course of history! For several years now my children have grown up watching CCC of America's animated DVD titled Juan Diego: Messenger of Guadalupe which is a great DVD for children about St. Juan Diego's life and Our Lady of Guadalupe and I highly recommend it for all families. But, as an adult I have been wanting to find a DVD that explained in greater detail the story and miracles surrounding this apparition since I have heard so many fascinating details about it through the years. I was pleased to find there is such a DVD and I received a copy of Guadalupe: The Miracle and the Message in exchange for this review. I must say this is a must-see for children to adults! This film was produced by Knights of Columbus and is narrated by Jim Caviezal (English version). On the menu, you can choose to watch it in English or Spanish. The English version does have Spanish speaking commentators, but there are subtitles in English. So I would recommend this DVD to children who can read subtitles well in order for them to be fully engaged in the film. It is an hour long full of fascinating and inspiring bits of history. The documentary begins with an inside look at the beautiful St. Peter's Basilica on December 12, 2014 as Pope Francis celebrates the Feast of Our Lady of Guadalupe and gives a homily about our beautiful Mother. Then details are given of Saint Juan Diego's story and the apparitions of Our Lady of Guadalupe that took place in 1531. It was interesting to learn in greater detail the symbolic meaning of the tilma and how the existence and preservation of the image has defied logic and science since it first appeared. I have always enjoyed hearing more about the miraculous image on the tilma and this film highlights the scientific research and experiments of the agave fiber cloth that continues to baffle the minds of scientists around the world. The film continues with Mexico’s history through the Cristeros War to present day and what a significant impact this moment in history has had on the United States and the whole world. The apparition triggered the greatest conversion in the entire history of the Catholic Church as 9 million conversions took place in 7 years! Several commentators keep your attention as they explain how Our Lady of Guadalupe has "united bitter enemies, endured as a symbol of hope and defied scientific explanation." 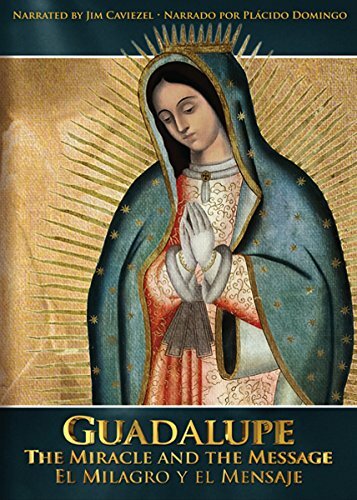 I enjoyed Guadalupe: The Miracle and the Message and learned so much more about this beautiful apparition. I gained a greater appreciation for the devotion of Our Lady of Guadalupe as she came to show us the deep love she has for each one of us as our Mother. I highly recommend the film to "Guadalupanas". This was a term I never heard of before this film. Guadalupanas are those who are devoted to or curious about Our Lady of Guadalupe. This is a perfect film to watch on or around December 9, the feast day of St. Juan Diego, or on December 12, the feast day of Our Lady of Guadalupe. For another review, be sure to visit a fellow Catholic blogger, Martianne, who also reviewed the DVD at Training Happy Hearts. She and her children rave about the film and Martianne also included some great hands-on learning ideas using Our Lady of Guadalupe as a theme. For more information about Guadalupe: The Miracle and the Message, you can visit the site. The DVD can be purchased through Amazon. I JUST thought about how I need to have the kids listen to the "coco" CD from Holy Heroes again now after reading your review as the term "Guadalupanas" reminded me of the call, "Vivo Crito Rey!" on that CD.